James Kinds‘ voice cackles with the sweat of the Mississippi delta and the grit of Chicago’s West Side. It’s the kind of voice that can translate heady emotion with a quick shift of tone. Such is the resonance of his vocals that he was declared “the best new voice in Chicago” by Living Blues magazine back in 1976. So why haven’t you heard of him? Good question. Kinds spent decades working low-key club sets in rented halls on the shadows of the Loop, out of the spotlight. 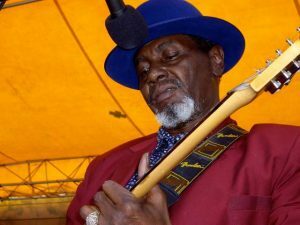 He moved to Dubuque, Iowa in 1993, which actually increased his visibility when the Iowa Blues Hall Of Fame inducted him in 2008. His recent release, Love You From The Top (Delmark), provides an in-depth exploration of Kinds’ musical gifts, and gives him some overdue recognition. Another Love You From The Top highlight is the presence of one of Kinds’ mentors, legendary blues saxophonist Eddie Shaw. His famous grooves sizzle through the thick R&B rhythm that laces through the memorable “Johnny Mae.” Thirty-five years later, Kinds still qualifies as one of Chicago’s best new voices. If you ask any blues guitarist about his influences, Albert King‘s name will most likely come up. He was the ultimate blues guitar master who guided a host of young blues guitarists on their path and Stevie Ray Vaughan was one of them. Vaughan idolized King, which was evident on the seminal Albert King With Stevie Ray Vaughan In Session live album released in 1999. The CD showcased King’s blistering single-string solos as well as banter that revealed the endearing relationship between the two guitarists. Recorded in 1983 for the live Canadian TV series “In Session,” the CD stood as the only document of the two legends playing together, as both had passed away by 1992. For the first time, video footage of the historic session has been released with a deluxe edition CD/DVD In Session package from Stax. For fans who know every note of the original release, the DVD heralds scads of details and previously unreleased performances that make the 11-year-old album seem fresh. To view King and Vaughan in their prime, tearing up strings side by side, is alone worth the price of the set. The DVD doesn’t follow the order of the CD, so it was a surprise to see it open with King and Vaughan performing “Born Under A Bad Sign.” King’s signature hit blasts into the studio as he attacks his iconic Flying V. Vaughan joins him in the assault, trading dazzling solos with his hero. What immediately jumps out to the viewer is the rapport between the two musicians. As Vaughan churns out a scorching solo, King looks on like the proud papa he essentially was. King addresses Vaughan as if it’s just the two of them recalling old times, when the young guitarist would be “draggin’ your little guitar and asking to sit in. You’d get in one or two good licks and then back off. I never thought you’d be as bad as you are. You really done growed up. Just don’t get a big head.” Vaughan dutifully nods. Another highlight that wasn’t included on the CD is “Texas Flood.” Vaughan had just released his landmark debut album of the same name and if he held back before, there was no more of that as he shut his eyes and belted out the chorus while unleashing scorching riffs. King retreats slightly, allowing Vaughan to command his song. Towards the end, King rises from his chair, his 6-foot 4-inch frame looming symbolically as he played his Gibson, strung upside down for his nimble left hand. With “Albert King” scrawled in gold on the neck, it was evident that he was indeed a king with a magical instrument. Combined with the 11-track CD, along with the evocative DVD, In Session is a significant historical document that’s a must for even casual blues fans. Studebaker John’s Maxwell Street Kings electric debut, That’s The Way You Do (Delmark), features Chicago blues veterans pouring out classic urban blues. The CD boasts 15 original tunes written by Studebaker John (Grimaldi) in the West Side tradition he absorbed during the heyday of Maxwell Street. A standout is “Slide By Slide,” which showcases expert slide guitar riffs.